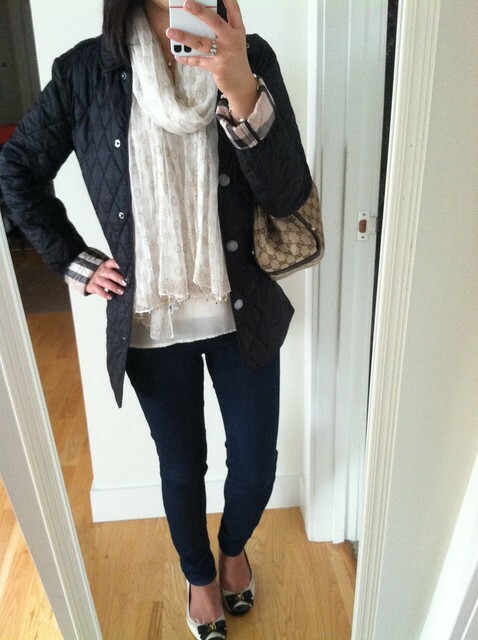 What I wore this cold, rainy Monday. I liked the above copy better than the Instagram version. It’s kind of annoying how Instagram always makes you crop photos you take on your iPhone camera if you don’t use the one within the app. Returning to work after a week off is brutal (nothing was done while I was out so I’m stuck playing catch up… story of my life). Just got off a call that started at 9PM ET. I’m taking a break to do laundry, eat some fruit and write this blog post before returning to my work emails. Then I’ll go to bed, wake up to attend a 9AM conference call and wash, rinse, repeat (borrowing a favorite phrase from one of my co-workers)… June is always a busy time at my company so we’ll see how often I can catch up on my favorite online reads. Not that I needed yet another reason to hate Mondays but when I was digging around for my fruits one of the yogurt containers in the back of the fridge gave me a paper cut. FML. Thanks Rinny. 🙂 Just subscribed to your site. It's so kawaii! drooling over your burberry jacket i want one just like that!!!! it's so chic and elegant on you! Thanks Lisa. You should get one too! It's so comfy, warm and soft even though it's lightweight. Thanks Jenny. Appreciate your stopping by and commenting. I adore your blog and can't wait to read more (once my internet is back up). I'm in love with your Burberry quilted jacket especially the nova checks at the cuffs. It looks like something I would wear to death on chilly days.